If you attended ALL FOR LIFE 2017, we want to say "THANK YOU!" for coming! We hope you had a great time & learned a lot! Would you please take a moment to fill out our survey? 1 - Boring 2 - Somewhat Fun 3 - Fun 5 - Very Fun! What is ALL FOR LIFE? 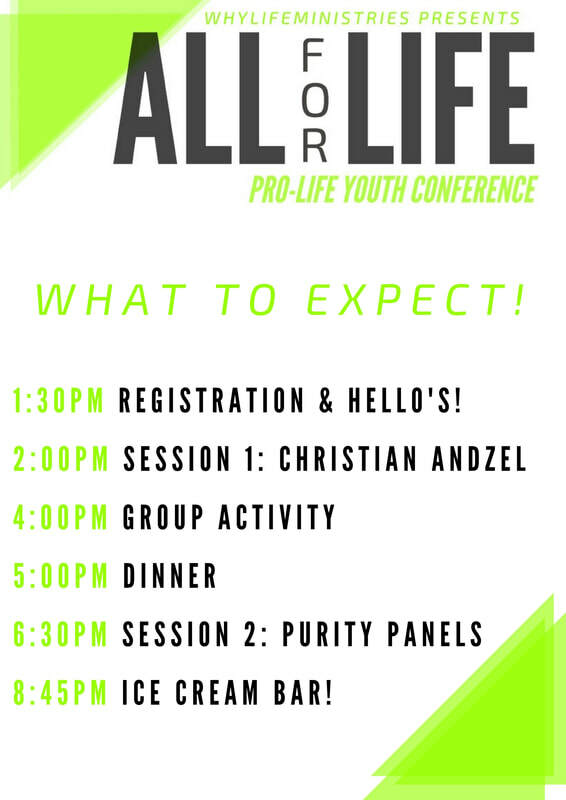 ALL FOR LIFE is a 1-day pro-life youth conference geared just for teens ages 12-18! Alongside several other youth groups, young people will get to hear from various speakers on the subjects of abortion, what it means to be pro-life, and how to rock a life of purity! Times of dynamic worship will give teens an opportunity to press into the presence of the Lord and deepen their love for our Creator! Awesome activities, a delicious meal, and an ice cream bar will all be provided during this life-changing conference! When is ALL FOR LIFE? Where is ALL FOR LIFE? Who is ALL FOR LIFE for? Specifically for teens committed to Christ and being pro-life! How much is ALL FOR LIFE? Worship with New Hope New York! Register for ALL FOR LIFE today! ​or filled out and turned in at the conference. The Medical Form can be found at the bottom of the registration segment! You can pay online via PayPal (click below) or send $10.00 cash/check in the mail. © 2019 whylifeministries.org. All Rights Reserved.